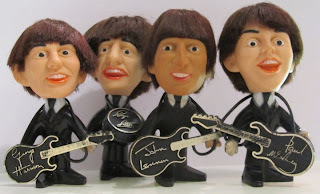 Liverpool Beatles Auction: Full Set Of Remco Beatles Dolls. These adorable rubber dolls were issued in 1964. They are 5" tall and made by Remco. Each one has their relevant instrument. The set of four is being sold in the Liverpool Beatles Auction in August. The estimate is £150-£200.